It takes a certain quality of brass neck to rewrite history in a history library. But that’s precisely what happened at the re-opening launch of the Tower Hamlets Archives and History Library in Bancroft Road last Monday night. In front of several dozen guests, first Mayor Lutfur Rahman and then one of the council officers responsible for jeopardising the future of the former Mile End Vestry Hall almost three years ago spun a yarn that would have made our story-telling camp-fire forebears purr with delight. A fairly accurate account of the events that saved Bancroft can be read here, a website that has input from Tower Hamlets’ most formidable historian Tom Ridge. I say ‘fairly accurate’ because it also fails to tell the whole story. During the spring and early summer of 2008, I was studying on a history course at Birkbeck College. While undertaking some research at Bancroft, I was told that plans were being advanced to sell the building to Queen Mary College. The plans included breaking up the collections, which included all back copies of the East London Advertiser, between two sites at the Museum of Docklands and the archive at the Royal London Hospital. If the hospital archives were unable to take any records, locations outside the borough were to be considered. I went back to the office and advised my editor. I said this decision would cause local and national outrage. He agreed and we were right. Our decision to launch a campaign to save the building was, as one senior figure in the Bancroft hierarchy said to me on Monday night, “the absolute key” in its ultimate survival. He said prior to that there were a number of other groups lobbying behind the scenes, but it was the weight we threw behind it that made them all “coalesce” . Over the next few weeks, we assembled a series of star names to back us, launched an important petition on the Downing Street website (helped, it has to be said, by East End Life editor Laraine Clay’s generous decision to publicise it in the council freesheet), informed a shocked and angry Stan Newens (the former Bethnal Green Epping MP) and held meetings with various groups. But it was the conversations behind the scenes that were also important. Labour councillor Marc Francis was then (possibly still is…) Lutfur’s right-hand man. This was June 2008 and Lutfur had become leader only a few weeks before. When I raised Bancroft as an issue, Marc couldn’t understand the fuss. He said the building was under-used, no one knew about it, that it was inaccessible by public transport and that surely it was better to contain the records and the service in a more modern and appropriate building. He said he and Lutfur were adamant that the decision would go ahead. We had a long row on the telephone about it. I said his argument about accessibility didn’t wash: Bancroft was a five minute walk from Stepney Green Tube. I said that if it was under-used, then wasn’t that perhaps because the council under-used it, that it didn’t realise what a gem it was sitting on. Why not improve the sign-posting towards it in the area, why not create a museum/history information room there, why not stage more events there? All these points were met with intransigence. I told him everyone knew there were serious concerns about Lutfur and that he had here a major opportunity to show everyone his attitude towards the heritage of the borough. Marc scoffed at the suggestion, calling it ridiculous. I told him that if Bancroft was sold off and the collections disbursed, that would be Lutfur’s tainted legacy and that’s the way our readers would see it. And so the penny began to drop. As the campaign gathered momentum and attracted national attention, Tom Ridge’s meetings with Marc and Lutfur became more productive. And eventually we all won. The ELA later won the regional newspaper industry’s campaign of the year award for our efforts. On Monday night, however, a slightly different version was told. 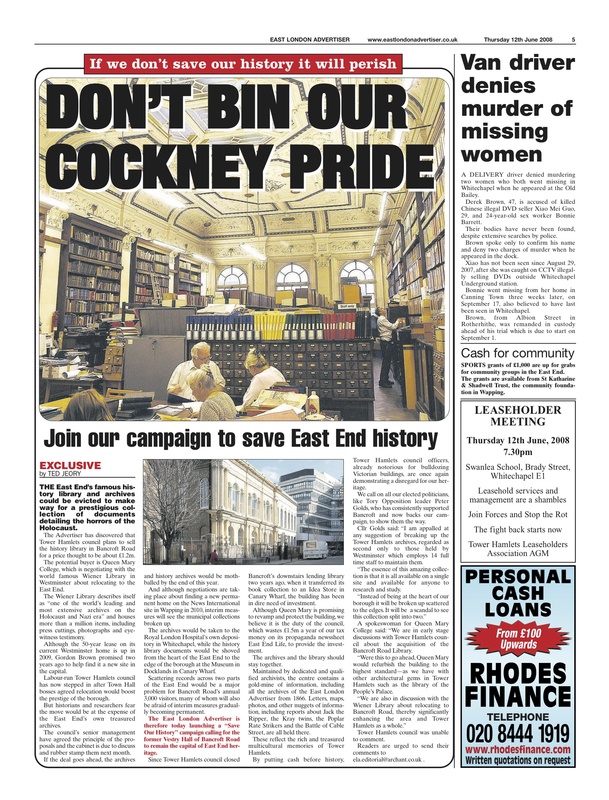 The East London Advertiser’s contribution was completely whitewashed from the record. Shamefully, neither Stan Newens nor Lutfur nor Judith St John, the head of the council’s library service and one of those most responsible for putting the library at risk in the first place, mentioned the paper’s campaign. The omission was also noted by many of the historians and campaigners who stood listening to the speech. Many refused to applaud. In particular, they were disgusted by the back-slapping congratulations of the council officers who were forced by the library’s many fans into action. The campaign was a fantastic example of the potential influence that a local paper can have when it works with and mobilises its community. Sadly, too many of them no longer do that. Wow, Ted. You’re so fantastic. Classic example of a really stupid decision. Council picks up the tab for a white elephant when a perfectly reasonable alternative existed. Next time you wonder why your council tax bill is so high, blame ted. Laughing. This wins the comment of the week award. JUDOKER says “Council picks up tab for a white elephant”! How long has this judo joker lived here? The elephant in the room on Monday night was his mates’ Rich Mix Centre. We’re still picking up the tab for that, so we’ll blame you and Denise and Rachael and Oona and Michael – not Ted. Millions have been sunk and are sinking into his pals’ Centre, including lately, Bancroft’s £350,000. Where is the perfectly reasonable alternative? Maybe the money would have been better off given to say, the Rich Mix Centre??? Just kidding. Couldn’t the archives be located in the new IDEA store in Watney Market? This goes on at pretty all the time, I’ve been to several council meetings and its breathtaking how different the minutes are sometimes from what actually transpired. Here’s a personal example: we were having a persistent problem in Stepney and several of us finally got pushed to the point of circulating petitions and approaching the council via deputations. We presented our issue, several times actually, and when things finally got rolling several councillors took absolutely all the credit. Speaking solely for myself, I considered it the cost of getting my issue addressed and problem fixed – just part and parcel of the political process in other words. Several of the people I was working with were (and still are) outraged by the selfishness, but still Councillors have to be seen to adding value in the eyes of their constituents so I don’t fault them for wanting some of the credit. Sure, a better balance could have been struck (and probably in your case as well Ted) but the end justified the means didn’t it? Mayor Lutfur Rahman should be congratulated because when most boroughs are closing libraries, he has opened Bancroft library. I totally agree. This is the right decision. There are many artifacts and records from the history of the East End which, particularly after the closure of Whitechapel Museum and Library, would simply have no where to go. – the comments stray seriously off topic. Comment was not off-topic, nor came from somebody posing as somebody else; nor was it “offensive and abusive and threatening” when “betel nut crew” is left on here time after time and ‘jokes’ about mango trees and deportation and then the “slappers” comment which was left up until it was objected to by this reader….so there was then “a risk of libel” ? I haven’t deleted any comment. One, which contained a new email address, was awaiting approval, which has now been given (I’ve been out all day). I’ve posted this on the thread about homophobia but as it concerns history I’ll give it here as well. Put ” Bangladeshi squatters in Eas London” into google and read the first few articles. This is real community organising with no government grants. Did what “essex lad” said: got Terry Fitzpatrick. Well done. There you are you see! You are so intelligent you are about to join the White Working Class. ESSEXLAD says he(?) did “real community organising with no government grants”- while the community who organised the Bancroft campaigns had government grants??? Ted/the ELA were funded by a government grant? Obviously not, so the local campaign was/is funded by a government grant? For the local campaign – the Public Meeting; the ad taken out for the Public Meeting (in the ELA), the website, the stalls; the petition; the campaign meetings; printing; admin etc. etc. were/are all organised and funded by campaigners themselves. Ted, tell ESSEXLAD, you could find the bill paid by a campaigner for the advertisement in the ELA. You were at the Public Meeting reporting for the ELA, so you can also tell him the Meeting was organised and paid for by local campaigners. Whatever else Stan Newens has done, I don’t think he has ever been MP for Bethnal Green. He represented Epping and later Harlow in Parliament. Thank you for pointing that error out (I wasn’t trying to rewrite history – honest). It takes an awful lot to provoke me into posting on this Blog, but your claim that myself “and Lutfur were adamant that the decision (to sell Bancroft History Library) would go ahead”, is false and needs correcting. I remember very well the “row” we had over the phone that day, mostly because I was so unimpressed with the way you made your case. I certainly did say the Bancroft was under-used, which it was, and that almost no-one knew about it. And I also said it was inaccessible, by which I meant both in terms of its location and the cramped set up within it. However, it is entirely wrong to say I didn’t understand what the fuss was all about. I had used the History Library myself and no doubt of its value. The original proposals we inherited obviously wouldn’t work and I understood full well the implications of splitting the library from the archive. My own thinking was that, if the cost of repairs was as high as was being claimed by officers and the building did have to be sold, the History Library and Archive could move to Bethnal Green Library. However, when Josh Peck and I visited that building, it was clear there wouldn’t be room there. The Museum in Docklands then told us it didn’t have room either. As I told you every time you paused for breath during your rant that day, no decision had yet been made on the sale and it wouldn’t be until future of the History Library and Archive could be assured. It beggars belief that you have twisted that into a claim I was “adamant” the sale had to happen. The fact that LAB never authorised the report to Cabinet rather undermines your claim. This is a VERY toned down version of what you said and meant. In fact, you repeatedly implied that a Bengali Muslim Leader of Tower Hamlets Council should not sell a building containing white East Enders’ history, and you would make sure the ELA’s readers understood it that way if he did. I’m not sure I know how to “scoff”, but if I did, it was the least such an argument deserved. Finally, you are also wrong to suggest that I alone amongst Cabinet Members persuaded Lutfur not to sell Bancroft in the end. Actually, by August 2008, Councillors Alibor Choudhury and Anwara Ali were firmly against the sale and openly backing the public campaign. I’m sure their lobbying was decisive. But I guess acknowledging that doesn’t fit with your own narrative arc. Tut tut, Marc. You’re more worthy than that. Or maybe just not as well versed in the history of the East End as you think you are. It was precisely because of that special and richly diverse history of welcoming newcomers of all races that is contained in Bancroft’s archives which made me feel so strongly that they should remain in tact. I reiterate the point I made in my post: I told you that Lutfur had a chance to prove to the doubters and critics that he wasn’t a one-community man. I said that if the sale went ahead, then our readers would conclude, rightly or wrongly, that he didn’t care too much about that rich heritage of the borough, that this was a symbol. I said that would be the realpoltik of the issue. You may well have been “unimpressed” with my argument, but you certainly signed up to it, even to the point of personally congratulating us for running a good campaign when you agreed to block the sale. Judging from the way that Bancroft was plastered all over his Mayoral campaign leaflets, Lutfur also seems to have seen the positive political spin-offs. Is this the Marc Francis who has presided over the racist persecution of a white family forced from their home by Bangladeshi gangsters who wanted to force the two younger daughters into prostitution? Is this the Marc Francis who has been aware that Terry Fitzpatrick has had the entire files on the case for more than four years after having been given them by the completely and utterly useless wastes of space so called housing officers in Limehouse who habded the files to him for photocopying because ” we don’t have the time to do it here”? Marc Francis is unfit for purpose and, now that the family concerned have lawyers, will probably be sacked soon. His claim to fame is housin expertise, tell us another one Marc. The files can be produced, but not by Marc. You’re very quiet Marc, not like you is it son? Wondering how you’re going to explain the lack of files when the solicitors letter reaches Lutfur? He’s not going to be too pleased is he? “Greenwich pedant” (@ 11) pointed out an error in your post. Loath as I am to comment here with “terry fitz” (Terry Fitzgerald/essexlad) offending and abusing commenters and his slur about “real community organising” – however there is another factual error about Bancroft Library that needs correcting. There was only one meeting, on October 8 2008. Isn’t that right? In English please. I try, and indeed do, in said medium, write that is. Think about this and try and reply, do! I want all of the above mistakes in my office by 0800 hours, you orrible little lot. Imagine a British Army SergeantMajor shouting that at you orrible lot.